BlitzTrader is next generation, most powerful and flexible algorithmic trading platform for professional traders and quant developers for rapid development, testing and deployment of simple to sophisticated trading strategies into constantly evolving financial marketplace. It is designed to increase trading efficiency and profitability by capturing alpha. BlitzTrader combines powerful features such as, multi-asset trading across multiple liquidity venues from your algorithmic trading strategies with comprehensive risk management system to ensure safety and soundness of your financial systems. It manages end-to-end automated trading lifecycle including market data feed, risk management, order management system, order routing and deliver exceptional trading experience with extensive range of advance features. Build on the top is BlitzTrader API and open framework to transform the system to your own customized needs. The BlitzTrader API enables quant developer to quickly develop, test and integrate proprietary trading strategies, exchange adapters, trading tools to create the best automated trading experience. In a business environment where microseconds matter, BlitzTrader platform efficiently to carry out transactions with the quality execution price, speed and precision trader expect and demand, giving you competitive advantage and improving your bottom line. The system multi-threaded architecture takes full advantage of muti-core CPU server to provide a scalable and cost effective way to implement low latency algorithmic trading strategies in co-location setup. The system is designed to run hundreds of strategies in muti-market scenario with microseconds execution to capitalize most from BlitzTrader. BlitzTrader provides seamless and efficient straight-through-processing covering entire trade life cycle with sophisticated framework for alpha generation to meet the requirements of traders in this new technology driven marketplace. The BlitzTrader straight through processing enables complete automation, increase efficiency, risk control of your entire real-time trading workflow with integrated global market data. BlitzTrader is built with open architecture philosophy with flexibility to trader specific customization and easy-to-manage developer tools to fully extend platforms and trading workflows to meet your unique needs. With powerful API model system enables you to rapidly develop, test and deploy your proprietary, complex algorithmic trading strategies, writing connectors to markets/brokers for order execution and customize the user interface as powerful you wants. 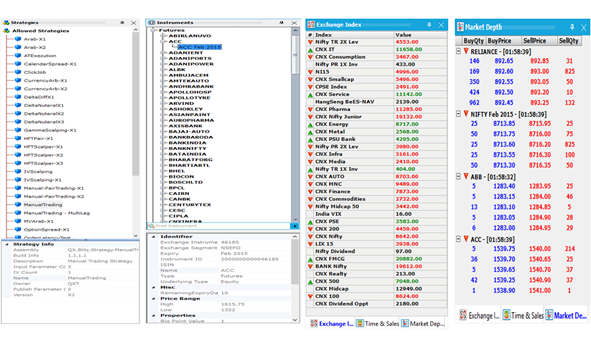 The system infrastructure provides access of live and historical market data. 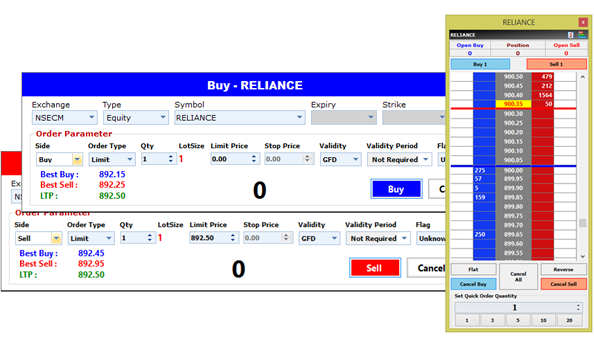 The open interface allows system to easily integrate with third-party applications like Matlab, Excel, Amibroker, Metatrader etc. Most home grown trading system is often a piecemeal application from different vendors that are not made to work together out of the box. BlitzTrader enterprise level feature with open and flexible API model saved you from time and resources it takes to build trading solutions from the ground up meeting all your unique automated trading needs and address the challenges of continuous evolving financial marketplace. 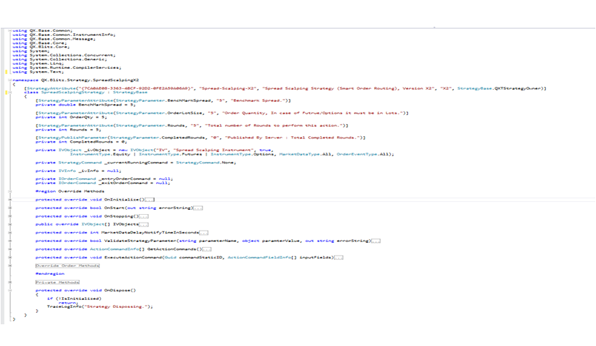 BlitzTrader API is built on top of Microsoft .NET platform, so strategies can be developed in any .NET supported language (C#, VB.NET, C++, J#...) and is fully integrated with Visual Studio platform through a set of ready-to-go templates. The platform efficiently leverages the Scalability, enhanced performance and throughput from latest hardware with multi-core and multi-threaded architecture. BlitzTrader enables quant developer to bring new production ready strategies in days rather than weeks or months and leverage API models to quickly build, test and deploy low latency algorithmic trading strategies. The goal is to provide a simplified, high performance and scalable end-to-end trading system platform, best to meet your trading goal and reduce time to market your proprietary trading ideas. Server based strategy executions provides capability to host your trading strategies directly to the proximity of the exchanges that significantly reduce time to execution as well as risk of multiple point failure. Traders can capitalize algorithmic trading opportunities across multiple markets with any combination of asset class. 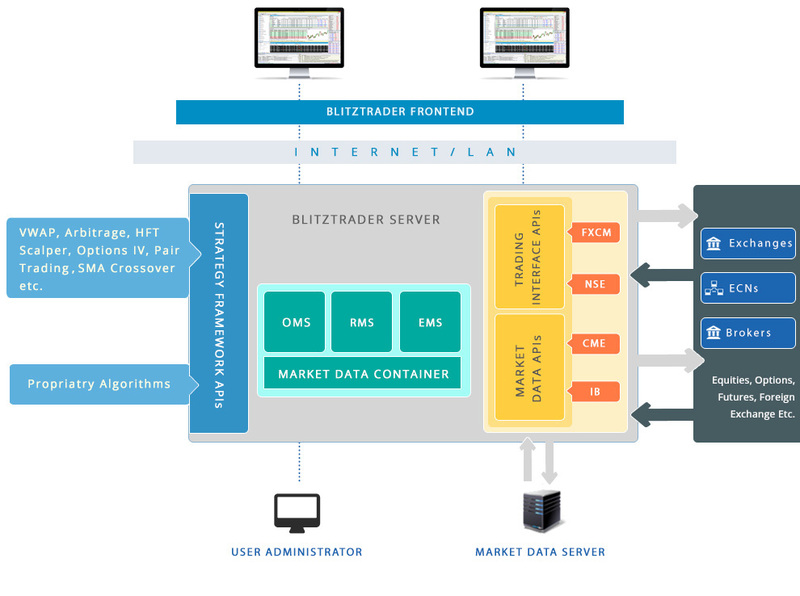 BlitzTrader provides a flexible framework and API model to develop and deploy new market connectivity as an adapter plug-in to the system. 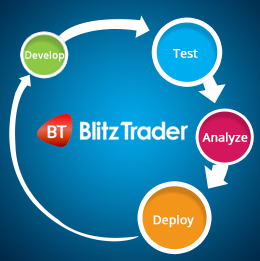 The BlitzTrader also provide a FIX Engine Connectivity API to rapidly develop new FIX based market adapters. Muti market connectivity enables powerful way of executing statistical arbitrage strategies across global market. BlitzTrader broker agnostic architecture ensures quants and developers to trade market of their choice and scale opportunities to new markets. Market connectivity APIs allows developer to quickly develop trading and market adapters of new exchange or broker system. The system provides cross-asset execution and is capable to model and trade your strategies in global equities, options, futures and forex markets. The system is flexible to support all native exchange orders i.e. 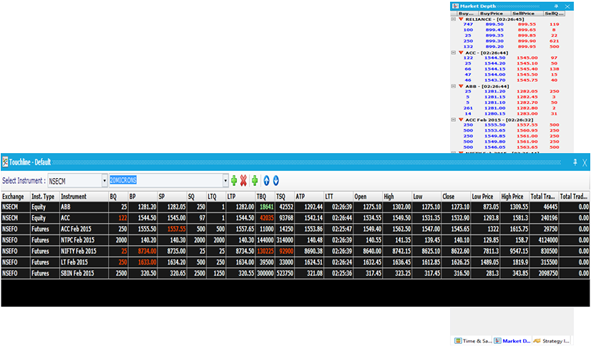 spread and multileg order to be directly used from trading strategies. BlitzTrader OMS and Risk management modules is an in-built systems which provides comprehensive access of trade positions, open profit and loss, other statistics to access and control the financial state of the system at strategy, user and portfolio level. Risk management component is based on comprehensive quantitative and financial limits, which allows users to set trading limits, validated before sending each order to the trading systems. BlitzTrader provides in built simulator designed to let you test your trading strategies without risking any real money and check the statistical performance and execution logic before system goes in production. 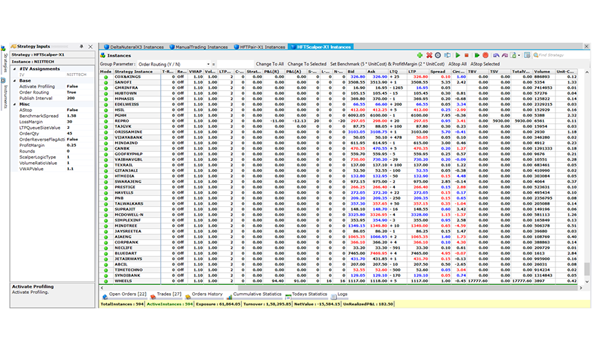 The trading simulation can be tested against recorded or live production market data. Strategy development API provides market agnostic programming variables to develop quantitative arbitrage strategies across different market and asset class. HFT strategies like market making, statistical arbitrage demands consistently placing of new limit orders, modifying it several time and cancelling it in case opportunity ceases out. Smart Order command manages all operations transparently with a single order command which makes strategy development more robust with less development time. Order command automatically managesthe state of orders and not route any actions if it is in a transient state. Many more powerfulconcepts in BlitzTrader API make quantitative strategy development process very easier. 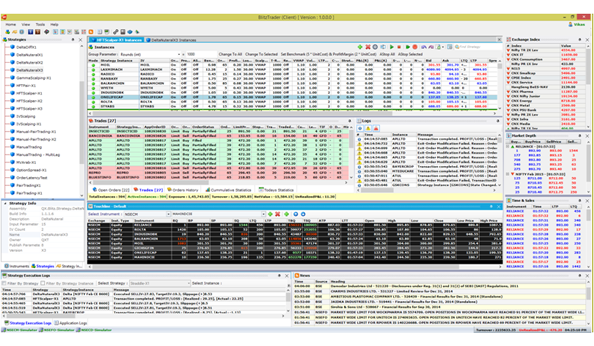 BlitzTrader offers an unified direct exchange market data feed handler solution to capture, normalize, enrich, store and disseminate market data with lowest possible latency. Its market data component captures real-time normalized market data from feed handlers, process and store to make it available for immediate or subsequent analysis. 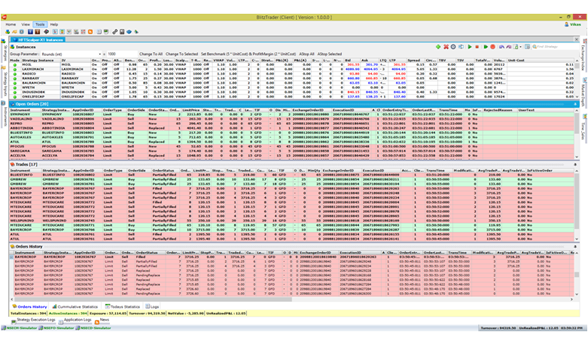 The data is stored in standard OHLCV (Open/High/Low/Close/Volume) bars and Tick time series. The bars can be created based on any prices information i.e. LTP, BID, ASK, MIDPRICE. QXMDS is also capable to store options contract implied volatility market information. QXMDS allows trading applications to retrieve and sync historical bar with real-time bar for strategy analysis and to generate trade signals based on your strategies rule. QXMDS provides API to access any time compression series data. 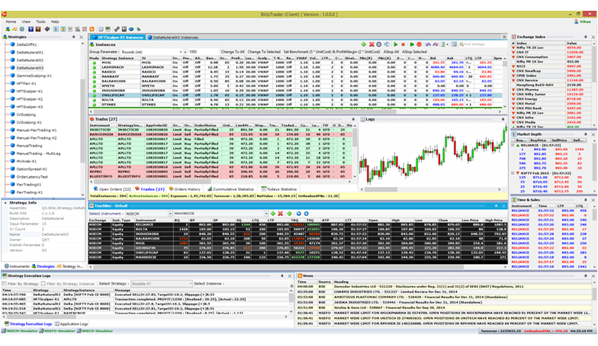 The BlitrzTrader Blotter interface has powerful, innovative features with open architecture to extend visual interface and is highly customizable to accommodate any new requirements. Traders used to monitor and act on automatic trading activities from strategies hosted on server side and view market prices, order management state, trading statistics, positions etc. in real time. BlitzTrader Trading interface API and open system architecture enables programmer to use Microsoft.NET based programming language for rapid creation and customization of powerful visual interface, trading features and tools to interact with server side hosted strategies. BlitzTrader API model provides comprehensive framework and a rich set of technical analysis and options analytics library to build quantitative trading models in an easy way. 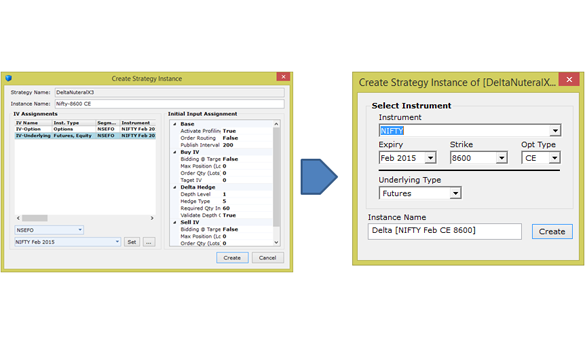 The options analytics and strategy development framework provides advanced analytics and market leading algorithms to automate single or multileg options strategies. With the growing role of news in trading automation; the BlitzTrader open framework allows clients to easily incorporate live machine readable news feed with variety of trading strategies to seize new opportunities with managed risk. 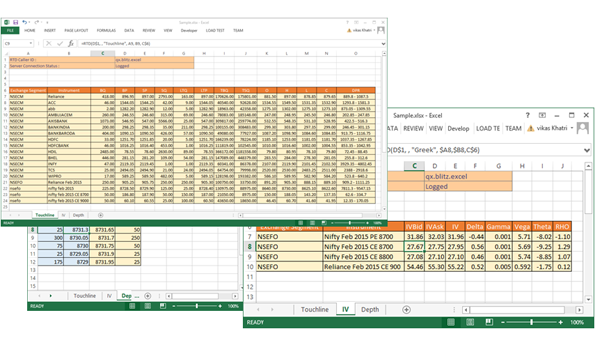 BlitzTrader provides enhanced RTD add-on service that makes it quick and simple to download real-time, market data and options Greeks into your Excel worksheets. The data is fully streaming and no refresh is required. Through combination of BlitzTrader and Excel provides a powerful analysis platform for traders and enables to create a highly customize application designed to your specific needs. The BlitzTrader provides a centralized monitor, full control and action on all activities related to trading session, access rights, connectivity, strategy permission and risk management. With the world’s most powerful trading platform. 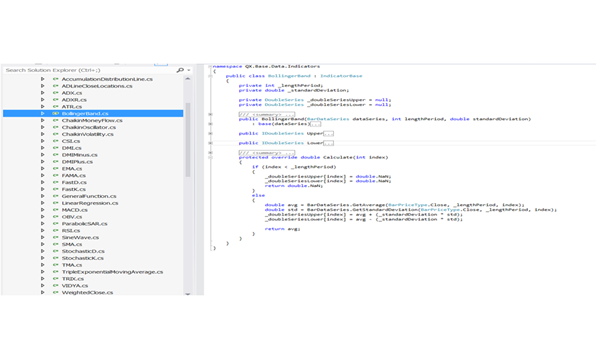 Develop powerful automated trading strategies with ease using BlitzTrader API leveraging Microsoft Visual Studio IDE and .NET framework. 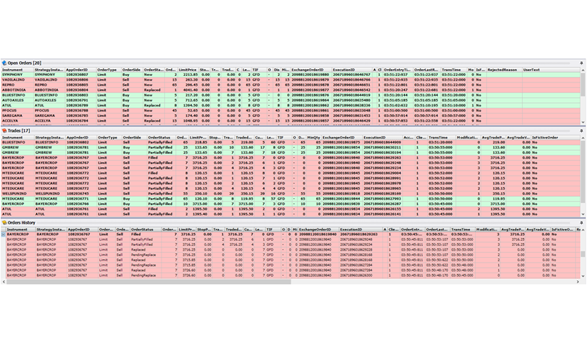 Custom command to control server hosted strategy instances. Strategy important custom state alert information on trading cycle complete. 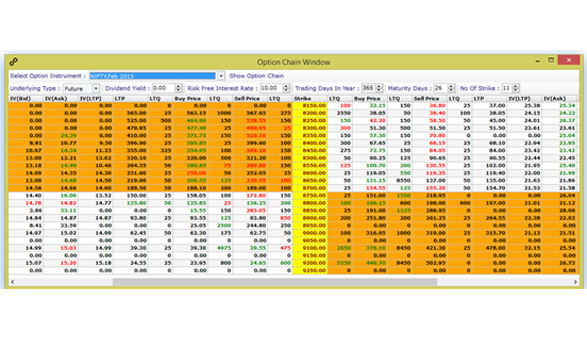 Options Chain Window monitoring real-time option greeks. BlitzTrader platform is unrivalled in its ability to scale efficiently with high performance multi-tier client/server architecture and loosely coupled components. Open APIs and a comprehensive Software Development Kit (SDK) to automate any aspect of trading. 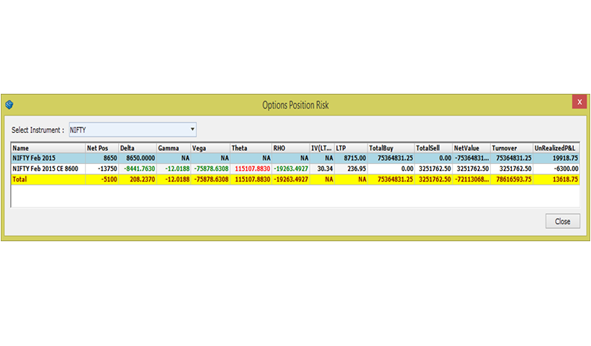 Portfolio risk overview based on derivative positions based on Greeks. 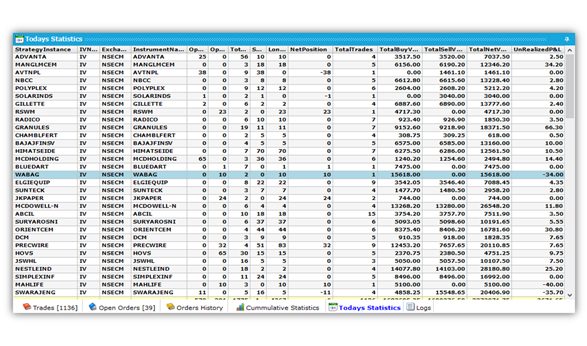 Integrated with Complex Event Processing server to infer meaningful events from the market and order event clouds. HFT scalping strategy employs a very short holding period position based on certain alpha predicting small price movement and exit based on profit target and stop loss. 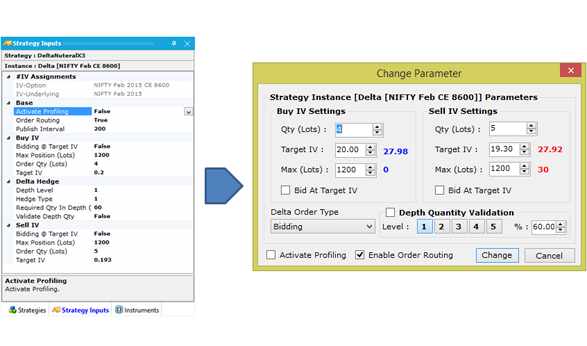 It includes exploiting various price gaps caused by bid/ask spreads and order flows. 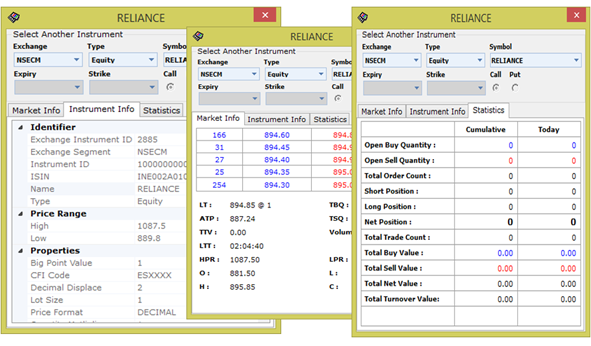 Arbitrage opportunities across related instrument in different exchanges. Mean Reversal strategy that identifies medium and long term opportunities used to exploit financial markets that are out of equilibrium and assumes prices will eventually adjust to and reflect the fair value with certain predictability. It mostly uses pair trading and uses the concept of equilibrium of oscillation of long and short positions and applies a set of rules to spot inefficiencies and produce return. Profit situation arising from pricing inefficiencies between securities that is identified through mathematical and statistical modelling techniques. 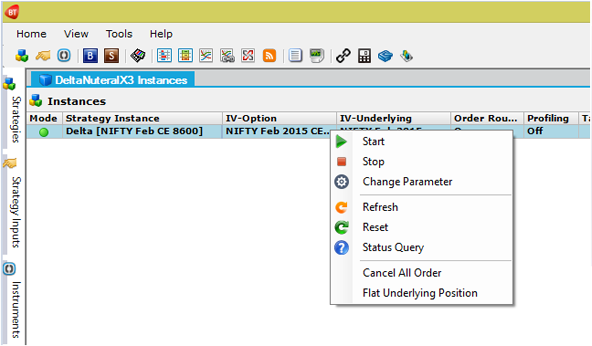 Index arbitrage: Trading Index against a basket of its component stocks. BlitzTrader provides comprehensive library and API framework to utilize 40+ technical in-build indicators and develop new indicators used for signal generation. Several investment management companies have specialized in exploiting news driven trading strategies that would affect the future sock price. Event driven hedge funds need to be on constant alert on news and company press releases as any potential profits could be “arbitraged” away after a short period after the event has taken place. Many news agency providers also provides low latency machine readable news feed that can be directly used in Blitz trading strategy to exploit sudden price movement. Such corporate news events are for example mergers, restructuring, litigation or bankruptcy, product announcements, examples for market news are announcements of economic indicators (unemployment rate, PMIs, etc.) or interest rate changes. Benchmark-Driven strategies seek to minimize slippage relative to client chosen benchmark to improve execution performance while minimizing market impact cost. Algorithms will attempt to find the best available price in the market, which often depends on minimising market impact by concealing a large order as far as possible. Techniques to achieve that often involve slicing an order into many smaller chunks. Examples: VWAP, TWAP, POV etc. the power of the BlitzTrader. QuantXpress Technologies delivers cutting-edge, high-performance, asset neutral algorithmic and execution management system that combines advanced technology access to professional traders and trading firm driving to greater business opportunity. BlitzTrader is a innovative, comprehensive, asset and broker neutral algorithmic trading platform and flagship product from QuantXpress providing an open framework and APIs to quickly develop, test and deploy algorithmic trading strategies, innovative features, tools and connectivity adapters.